We booked our honeymoon to Disneyland on a last minute whim. We were so excited just to be going that we booked nothing in. There were no itineraries, and zero game plan. However, once we got to Disneyland, we were halfway through the first day when a young couple we met on Mickey’s Fun Wheel was incredulous we didn’t know about all the cool ways Disneyland make your honeymoon extra magical. Here are a few things we found out. They’ll give you ‘Happily Ever After’ badges. What’s more, you’ll get a congratulations phone call from Uncle Mickey himself, plus the rest of the Fab Five. We got a special honeymoon dessert at Ariel’s Grotto. All our wait staff wished us congratulations as they walked past. Once your purple badges are on, all the cast members at Disney will wish you congratulations. It’s like all of Disneyland is there to celebrate your love. It almost felt like a second wedding day. I really felt like an actual Disney princess getting to have her happily ever after. 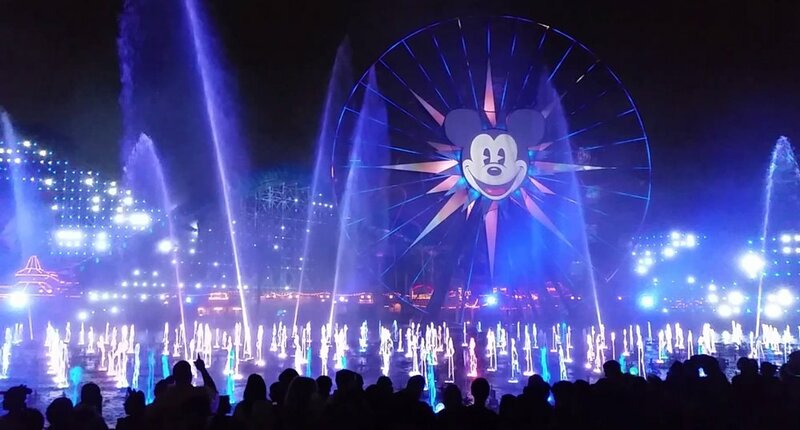 Splash out on a dinner and VIP viewing package for World of Color and the fireworks. Hey, it’s your honeymoon after all! Disneyland at night time really is a magical fairytale. Plus, there is something that is so romantic and bonding about unleashing your inner child with your new husband, being excited about Disney, roller coasters, and cotton candy. We got a porcelain Mickey and Minnie bride and groom. You can also get bride and groom Mickey ears. Disneyland can deliver your precious souvenirs to your hotel if you’re staying at the resort. If not, they will send them down to the front of the park to wait for you. You can register for a Disneyland honeymoon registry. You can request anything from credit toward a hotel stay to souvenirs. I wish we had known about this! It gives some direction to guests wishing to give a gift beyond just putting some cash in a wishing well, and is a great alternative to a traditional gift registry if you and your husband have already been living together for some time. If you really want to splash out and are staying at the Disneyland Resort, get in touch with Disney Floral and Gift and surprise your honey with the Romance Package From Mickey and Minnie with Love for $265 USD. You get two personalized robes to keep, LED votive candles in candleholders, 3 full sized h20 bath items, rose petals on the bed and throughout the room and chocolate covered strawberries. Enjoy your Disney honeymoon in style and keep the treasured memories for a lifetime.